Track and field summer competition. The Athletics Victoria Shield is the official summer competition commencing in October. Keilor St Bernard’s competes in Yellow zone at rotating venues including Aberfeldie, Newport, Lakeside, Werribee or Doncaster. Each meet features a variety of athletics events. Across the season there is scope for athletes to compete in their chosen discipline. Many athletes compete in other events if their main event is not scheduled on a particular day. The summer season concludes in March with the Shield final. 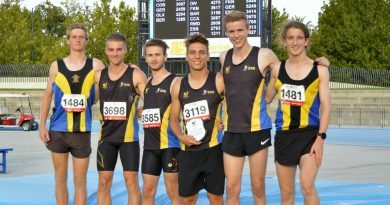 Keilor St Bernard’s usually has several teams lining up for premiership glory at Lakeside Stadium, the official home of Victorian athletics. We also conduct a number of club events each summer.